The Australian Electoral Commission (AEC) is the federal independent agency in charge of organising, conducting and supervising federal elections and referendums. 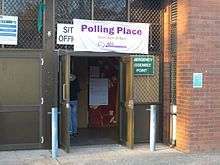 State and local government elections are overseen by separate Electoral Commissions in each state and territory: New South Wales elections are conducted by the New South Wales Electoral Commission, in Queensland it is the Electoral Commission of Queensland; in Victoria it is the Victorian Electoral Commission; in South Australia it is the Electoral Commission of South Australia; in Tasmania it is the Tasmanian Electoral Commission; in Western Australia it is the Western Australian Electoral Commission; in the Northern Territory it is the Northern Territory Electoral Commission and in the Australian Capital Territory it is the Australian Capital Territory Electoral Commission. The AEC's main responsibility is to conduct federal elections, by-elections and referendums. The AEC is also responsible for seat boundaries and redistributions, and the maintenance of an up-to-date electoral roll. Under the Joint Roll Arrangements, the AEC maintains the electoral roll for the whole of Australia, which is used by the state and territory Electoral Commissions to conduct their elections. The AEC publishes detailed election results and follows up electors who fail to vote. The AEC is also responsible for monitoring the activities of registered political parties, including receiving returns from parties of donations and expenditures, and the publication of the information. It also disburses public funding of political parties. The AEC also plays an electoral education role, aiming to educate citizens about the electoral process by which representatives are elected, and by which the Australian Constitution is changed (referendums). It also plays a role in industrial voting (eg., votes on industrial action). The Commonwealth Electoral Act 1902 set up the framework for the Commonwealth electoral system, which was administered as a branch of the Department of Home Affairs. In 1973, the Australian Electoral Office was created, a name it retained until 21 February 1984 when it became the Australian Electoral Commission (AEC), a Commonwealth statutory authority. The AEC is answerable to the Joint Standing Committee on Electoral Matters of the Parliament of Australia, and must report on how elections were carried out and the success of elections in general. AEC has a National Office in Canberra and an office in each State and Territory: Adelaide, Brisbane, Darwin, Hobart, Melbourne, Perth and Sydney. Each House of Representatives electorate has a Divisional Returning Officer responsible for administration of elections within the division. Each State also has an Australian Electoral Officer responsible for administration of Senate elections. Since the loss of 1,400 ballots during the recount for the 2013 Western Australia Senate election and the subsequent 2014 special election the AEC has been under significant scrutiny. On 21 February 2014, Ed Killesteyn announced his resignation as Australian Electoral Commissioner, with effect on 4 July 2014. He took personal leave until that date, and Deputy Electoral Commissioner Tom Rogers acted in his place, before being appointed to the position. ↑ "Parliament of Australia: Joint Committee on Electoral Matters: Home Page". Aph.gov.au. Archived from the original on 8 January 2011. Retrieved 2010-12-25. ↑ Matthew Knott (30 May 2014). "AFP to investigate thousands of cases of multiple voting in 2013 election". The Sydney Moring Herald. Fairfax Media. Retrieved 30 May 2014. ↑ "Media Release: Appointment of the Electoral Commissioner". Special Minister of State. 12 April 2013. ↑ Bourke, Latika (2014). "Ed Killesteyn resigns as Australian Electoral Commissioner". Australian Broadcasting Corporation. Archived from the original on 16 September 2014. Retrieved 2014-02-23.